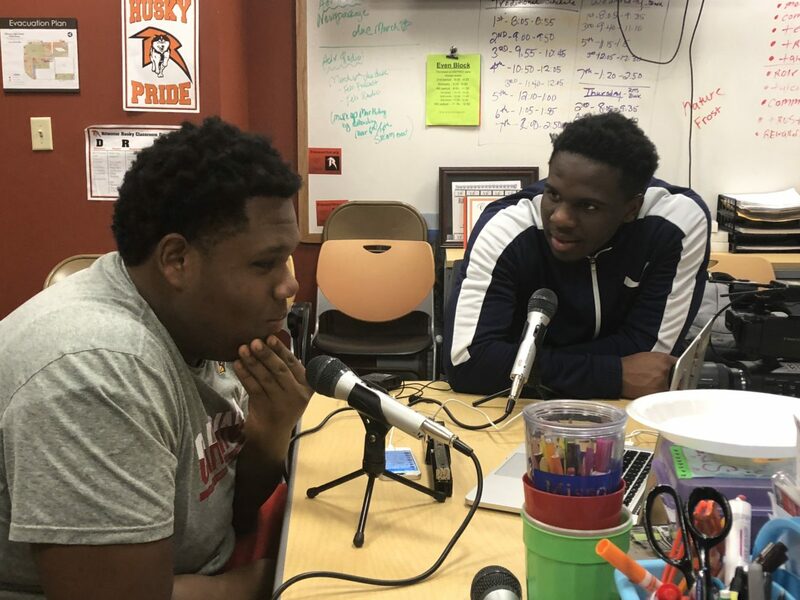 Listen to Ritenour High School broadcast adviser Jane Bannester and her students talk about their adventures in podcasting — what they’ve learned and how they’ve grown personally — in their own voices. I love new trends in broadcasting, and nothing is hotter today than podcasting, those episodic audio or video programs available for download by an audience. "The value of podcasting reaches much further than the products students create." Despite terrestrial radio’s consistent hold on listeners, podcasting has seen an ever-present increase of listeners with 21-24 percent growth year-over-year. Can you believe the largest growth is coming from the age 18-34 demographic? When we see a media gaining ground in culture, it’s the right moment to invest a staff’s time and resources into becoming prolific in that medium, and that’s what we’ve done at Ritenour High School to build students’ skills and their confidence as journalists. First, we must understand that podcasts are very specific, topic-oriented shows. I consider them comparable to magazines; my students get that concept. Creating too big of a topic can leave students disoriented about what to share with their audience. Keep it simple, yet leave room for multiple episodes. Once students connect with a group and are assigned a podcasting topic, they take on the role of reporters with ease. They love interviewing and talking with fellow students, once they get over those first-time jitters. You are only as good as your microphone. With the increase in audio recording, many companies have jumped on the bandwagon to create easily accessible and affordable equipment. B&H Audio and Video has made purchasing easier by providing bundled deals for podcast beginners. If you’re interested in moving beyond your classroom walls, consider using handheld recorders like the Zoom brand. After my students used these once, they never wanted to use anything else. The Test: Would you listen to it? It’s the first question I want students to ask themselves about a podcast: Would you listen to it? Don’t create a piece for a class project; create it for an audience. Asking your audience to listen is much more difficult when they have so many other options. When my students start, I keep them to two minutes of content. With amateur content, it’s a good rule of thumb. Keeping it shorter will help learners create a concise message. Does it leave me with new information? Have I gotten a new understanding on a topic that I didn’t have before? Can I see a different point of view that I never considered? These are all questions students can ask of their product to see if it’s worth listening to. Some students prefer to start with questions: what do I want to know more about the topic? Who are the most important people who can answer these questions? Others need to start with research on a topic: if I’m looking into racial diversity in St. Louis, I need to look at the history and find data that supports the premise that this is a long-standing problem. From there, I ask students to show the emotion behind the story. For me, it’s a major part of why I love podcasts. Hearing people share their personal truth makes it worth listening to. With an audio story, people speak freely, while facing a camera can seem more intrusive. This concept resonates with students when they are doing audio stories. I tell my students that the editing software has a short list of requirements. Basics include cutting audio, adding and overlaying tracks, and mixing sound levels. Audacity has been a staple for podcasting in my room since we began 10 years ago. It conveniently allows you to perform the basics, while still retaining some editing freedom. For those wanting to use a Cloud software option with a Chromebook, or those who have multiple students who need to access a project, my students love using Soundtrap. It performs like Macintosh’s Garageband with added sound effects and instrumentals. The boom in podcasting has brought a boom in hosting providers. Options like Soundcloud, Podbean or Podomatic allow for free websites or cheap pricing for yearly subscriptions. You can also use YouTube if you choose to make the sound files into videos with a photo or your logo in the background. The value of podcasting reaches much further than the products students create. My students are amazing speakers, can navigate interviews with the proficiency of a pro, and they are growing confident as they hear themselves profess their thoughts. This trendy medium can be a gateway to strengthening core journalistic skills, but the great thing is, most of my kids never know it. They just think they are being cool! Jane Bannester works for the Ritenour School District, in St. Louis, Mo. Currently she teaches the nationally awarded KRHS Media program. Jane speaks locally and nationally on topics of Podcasting and Drone journalism. In 2017, Jane was recognized as the Missouri Journalism Educator of the Year, a recognized Broadcast Advisor by the Journalism Education Association, and made the 2017 MediaShift EducationShift20 list for innovative scholastic journalism educators.